Quickie Review of Ralf Bauer’s Yoga 2 – A t i s h e h. Dance. Fitness. Joy. For most people, going to the Alps means one of two things, skiing or snowboarding, combined with liberal amounts of melted cheese. Since any of those items are likely to put me in the hospital, I decided I would do yoga instead. This was also a chance to check out some of the local yoga videos in Germany, although I had to be careful, of course, to buy only those specifically marked as Region Code 0. 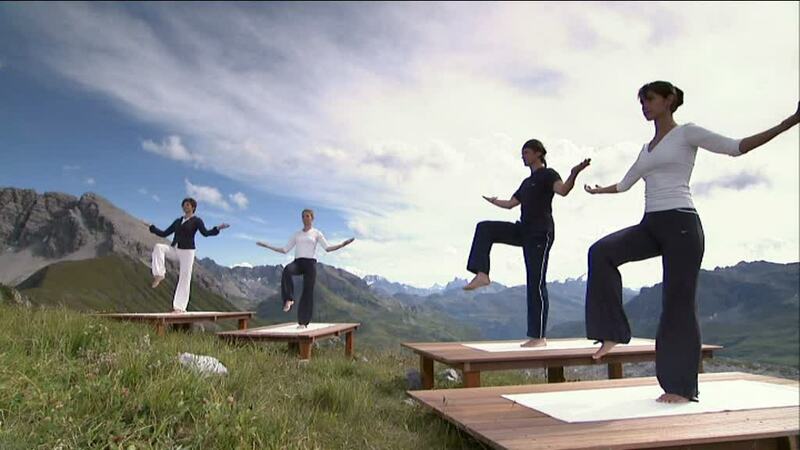 One of my choices was Yoga 2 mit Ralf Bauer, and to be honest, part of my motivation was that the practice is filmed in the mountains (albeit in summer). After all, it doesn’t really make sense to be doing yoga on a cold mountaintop and looking at people stretching on a Caribbean beach, does it? The other thing that drew me to the video is that it actually has a variety of shorter programs (morning and evening yoga, meditation, guided relaxation) along with a 48-minute practice. I’ve really only done the main practice so far, so I haven’t even begun to use all the options available. The main practice itself was quite a bit easier than I expected — it’s really aimed at people who might not have done any yoga at all, and therefore doesn’t push too far. Usually, a simple combo is guided, and then a very slightly more difficult addition is added to that combo on the third and fourth repetitions. What I enjoyed, however, was the fact that every single move was combined with a cued breath. It reminded me of my Gary Kraftsow Viniyoga DVDs. Part of what I find so relaxing about them is not having to think about anything but following the cues. I can imagine this workout being good for those days when I want to do something medium-length, but am not feeling too pliable. During my mountaintop practice, I had plenty of time, so I wound up using it more as a warmup for my own, added asanas, which lasted another hour or so. The whole practice wound up being some kind of magical calming drug — simply wonderful.